I have been learning more about my new Silhouette Cameo, and its amazing capabilities. So today, I revved it up and made some very intricate cuts to show off the delicate details the Cameo can cut. At the same time, I wanted a comparison to the Cricut cuts. I had the perfect opportunity to make and compare multiple cuts last evening, when I made more than 2 dozen same/similar cuts to share with fellow scrappers via "cut swap groups." I belong to two cut swap groups on Facebook ("KC Croppers" and "Karle's Passion"). Each group has six members, so the idea is to mail (via USPS) two cuts to each of the other members of your group(s), each month in which I've signed up to participate. This means I need 10 of each of two cuts. This presented me with an opportunity to have my Silhouette Cameo humming and my Cricut chirping at the same time. Above, left, you'll see the two cuts I made with my Cricut. These cuts were done using the Cricut "Life's A Beach" cartridge. 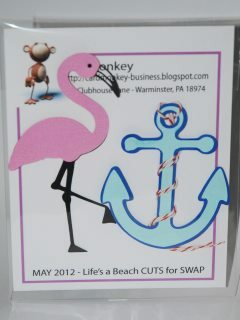 The flamingo is done at 4", while the anchor is cut at 3". I was pleasantly surprised at the Cricut's ability to cut the fine lines in the beak and legs, without tearing. It did not, however, cut all the way through the pink top for the tiny eye. The dot you see there (for the eye) is instead a black seed pearl. 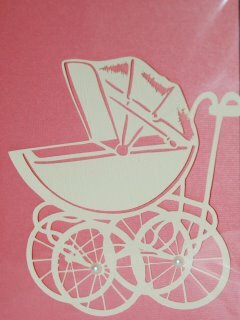 In comparison, this baby carriage (cut at 4") at right is the cut I made with the Silhouette Cameo, using a file purchased from Silhouette's online store for $0.99. In most cases, even the thinnest cut came cleanly off the mat. Some of the very small detail (e.g., to the top left of the left hand hub pearl) needed to be "weeded" and the paper's edge frayed a bit there. Where the cuts look raggedy in the pram's bonnet, that was intentional and how the cut was designed. I added the pearls to the hubs for interest -- the hub itself was well cut in a perfect circle. Be sure to stop back tomorrow and Sunday when I'll be participating in the 2-day "Flowers, Flowers Everywhere Flowers Blog Hop" . I've made 9 cards using Jillibean Soup's "The Card Kitchen" card kit.